The introduction of free mapping services from Google Inc. with Google Maps and Google Earth in the last months has revolutionized the way we view maps on the Internet. 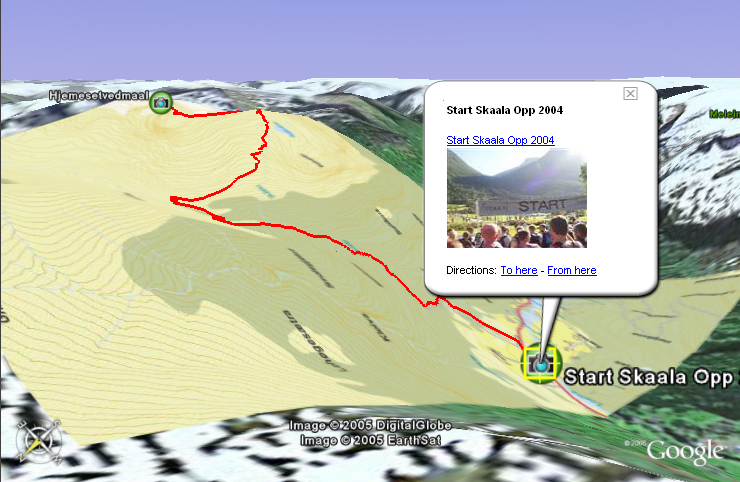 Create your own Google Maps web site with 2D map view of GPS track. Create your own Google Earth file and fly in 3D terrain over your GPS track. Import Map layers from Sportsim to Google Earth. Update - Gjermund was kind enough to clarify what actually is happening here. James, to set the record straight, Sportsim does not move away from the ESRI ArcWeb Services, we add on Google Maps and Google Earth as external web service add-ons to the software itself. The software and it’s functionality will still run on maps and images from ESRI ArcWeb Services. Also, according to Google Maps API terms we are NOT allowed to bring their maps into the application, they can only be browser based. What is really cool about what Sportsim is doing is that they are overlaying ArcWeb Services on top of Google Earth (see image below). It was so subtle that I didn’t even see it until I read what he wrote. So Gjermund is leveraging the best parts of ArcWeb Services and Google Earth to make a much better product. Hows that for a mashup?